No doubt about it ..... people are amazing! This morning, I got the opportunity to put on my CERT hat and vest to help the Police in my town. A little background is in order, I suppose. Every year, South Plainfield hosts the New Jersey High Schools Statewide Track Meet. We're located very centrally in the state; and just about every major highway in the state is more or less a stone's throw away from South Plainfield. So you can imagine the havoc as just about every high school in the state of New Jersey sends their Track & Field team to our little town. Parking is handled at the high school field itself; as well as the nearby Community Pool parking lot and the nearby Police Athletic League building parking lot. Even adding these, there's nowhere enough parking, so it spills off onto local side streets. It takes a lot of manpower to get through this; and the CERT Teams in town have been helping out since we first formed up back in 2004. My job was to stay at the top of the road that runs along the athletic field, which had been made a One Way street for the event; and not allow cars access. The idea here was to allow better access for the School Buses that would be dropping off and picking up student athletes throughout the day. For the most part, people were good natured and cooperative. There were exceptions, however. Boy, where there exceptions! I've never been sworn at by a female coach before. She came barreling down the road, trying to gain access to the field. I stopped her car at the point of "No Entry" which was only about 150 feet or so from the admission gate. "Ma'am, this is a one way street at this point. You can't go down this way". "But I'm a coach and I'm late!" "Sorry about that Ma'am; but you can't go down the street. You can park here and get out and walk the rest of the way; but you can't drive down this street." "Says who? Are you with the Police?" "Ma'am, I'm with the Office of Emergency Management. The police have given me the task of traffic control at this point". "Well, I don't care who you are". Next thing I know, she hurls a few expletives my way and drives right past me - going the wrong way down a One Way street. Then, the next thing I saw was a Police Officer asking her (very loudly) why she didn't listen to what the man wearing the green vest had told her. By the time all was said and done, she was REALLY late and a probably a lot embarrassed. She was lucky that all that happened was that she got a lecture by the police and wasn't issued a summons for a moving violation. That would have cost her a nice chunk of change. Most people complained about having to park so far away from the event and having to walk. To me that was extremely funny coming from folks who were about to observe an athletic event that features running. I guess it just goes to prove that you don't have to be in shape to watch people who ARE in shape do their thing. Oh, and by the way, no one had to park more than about 4 or 5 blocks away from the event. Amateur Radio played a big role as those of us who were on traffic detail are all Hams and RACES operators. Although this wasn't a RACES event, we all kept in touch with each other on 2 Meter simplex rather than tie up the Municipal radios we were given. Plus were were able to switch our HTs over to the NOAA weather frequencies to keep tabs on a line of severe thunderstorms coming through the area. Sure enough, we were able to give the Police and Track and Field organizers about a half hour's warning that a squall line was about to move through. And it came through right on time! We all got drenched in the process; but we were able to move the athletes and spectators to safety in an orderly and safe manner. It's a good thing that my Alinco HT is gasketed against moisture; because by the time I got home, I pretty much had to wring it out. This appeared on the FISTS e-mail reflector today - thank you, Nancy! 1. WHEN I ASSUMED THE CHIEF, NAVMARCORMARS POSITION IN NOVEMBER, 1997, WE WERE MORE THAN A YEAR INTO THE DOD MANDATED BAN ON CW ON MARS FREQUENCIES. A. SINCE THAT TIME THE FEDERAL COMMUNICATIONS COMMISSION HAS, IN STEPS, ELIMINATED THE MORSE CODE REQUIREMENT FOR AN AMATEUR LICENSE. ALL EMERGENCY COMMUNICATORS KNOW THAT WHEN VOICE AND OTHER DIGITAL MODES SLOW TO A CRAWL OR BECOME UNUSABLE, CW CAN STILL BE USED. B. I REMEMBER THE NORTHEAST ICE STORM SHORTLY AFTER I BECAME CHIEF AND THE UNNECESSARILY LENGTHY EFFORT BY ALL OF SOUTHERN NEW ENGLAND TO RECEIVE ONE VOICE EEI FROM A NORTHERN NEW ENGLAND MEMBER WHOSE ANTENNA WAS COVERED IN ICE AND LYING ON THE GROUND. IT TOOK OVER AN HOUR WHEN CW COULD HAVE HANDLED IT IN A FEW MINUTES. C. AS MORE AND MORE OF OUR MEMBERS ENTER MARS WITH NO MORSE CODE EXPERIENCE, I AM AFRAID THAT WE WILL SOON LOSE THAT SKILL SET IF WE DON'T DO SOMETHING. 2. IN VIEW OF THE ABOVE AND EFFECTIVE IMMEDIATELY, AREA AND REGION DIRECTORS ARE AUTHORIZED TO ESTABLISH CW TRAINING AND TRAFFIC NETS IN THEIR RESPECTIVE AREAS AND REGIONS. ALL STATE DIRECTORS ARE STRONGLY ENCOURAGED TO BEGIN CONDUCTING TRAINING IN CW ON THEIR TRAFFIC AND TRAINING NETS. 3. SINCE THE RADIOTELEGRAPH PROCEDURES WERE ELIMINATED BEFORE THE PUBLICATION OF NTP 8(C), REF A WILL BE POSTED UNDER THE DOCUMENTS TAB ON THE NATIONAL WEB PAGE SOON. USE THESE DRAFT PROCEDURES UNTIL A FINAL TRI-SERVICE MARS PROCEDURE FOR RADIOTELEGRAPH IS DEVELOPED AND PROMULGATED. 4. MARS: TOGETHER WE CAN ACHIEVE ANYTHING. Finally, someone is using the common sense that the Dear Lord gave them !!! SUSAN SARANDON, who appeared in three films last year and won kudos for her TV movie "Bernard and Doris," is still not a contented soul. She says if John McCain gets elected, she will move to Italy or Canada. She adds, "It's a critical time, but I have faith in the American people." You know, when these sanctimonious, over paid, overly self-esteemed celebrities make asinine statements like this, I seriously consider ponying up the money to buy the airplane ticket. Hey Susan, (who grew up in the town next to mine, BTW) don't let the glass hit your _ _ _ on the way out, OK? I went out again during lunch time. A Beautiful day (no, that's not a typo, I meant to use the capital "B") again in Central New Jersey - crystal blue skies and temps in the upper 70s. I plunked the Hamstick on top of the Explorer and was disappointed in the slim pickin's as far as signals on 20 Meters was concerned. I heard a few, one or two loud ones; and called CQ for a bunch with no results. Today was one of those days where if I was fishing, I would have lost all my worms with no fish to show for it. I'm feeling a bit on the energetic side tonight, so after the kids go to bed, I think I'll head down to the basement to work on the ATS3 for a bit more. The forecast is for some boomers to start moving in tonight; so probably no actual on-air time tonight. It was a beautiful day here in Central New Jersey! The skies were blue, there were no clouds, it was slightly breezy and the temperatures hovered around the 70 Degree mark. It was a perfect day to head out to the park during lunchtime for some QRP. I ended up having a nice QSO with AI4IC. Kay, who comes from Tennessee, was vacationing at the Outer Banks in North Carolina. Kay was using a Yaesu FT897 to a Buddipole located in the attic. Kay had a beautiful 599 signal into New Jersey; and I enjoyed our 20 Meter QSO. Previous to that, my CQ was answered by another 599 station; but even if my life depended on it; I would not be able to tell you who it was that was calling me. The station answering me sent a string of letters with no breaks whatsoever. It was a jumble and mish-mash of consonants, vowels and numbers. I was able to make out my own call; but that was it. It is so very important to watch your spacing when you send Morse Code. The breaks between letter elements are SO important! They make all the difference in the world between Morse Code that is music; or Morse Code that is gibberish. Boy, that was even hard to type! That is what the Morse Code I was trying to receive today was like. Unfortunately, I just couldn't make it out. I think it was a 5 station; but I thought I had copied WL5. Now THAT makes no sense whatsoever as the WL would have indicated Alaska; and I doubt there are any WL5s in Alaska. I can understand folks wanting to up their code speed by sending fast. Please make sure you don't send so fast as to neglect spacing and thus, readability. "We have gone forth from our shores repeatedly over the last hundred years and we’ve done this as recently as the last year in Afghanistan and put wonderful young men and women at risk, many of whom have lost their lives, and we have asked for nothing except enough ground to bury them in, and otherwise we have returned home to seek to live our own lives in peace." As we celebrate Memorial Day 2008; or as it used to be called, Decoration Day, it is a good and just thing to pause for a moment and remember all those brave men and women who made the ultimate sacrifice in service to their Country. From Bunker Hill to Baghdad, our brightest and best have taken upon their shoulders the burden of defending our country and our way of life. 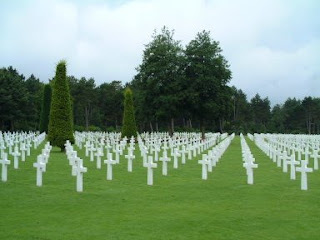 We owe them a debt of gratitude that can never be repaid. To all who have served our Country, we thank you from the bottom of our hearts for your service . To those who have paid for our freedom with your lives; you are in our prayers, forever. Today was a crazy day. All the plans I had for this morning went by the wayside when I woke up to find a voice message waiting in the "Inbox" of my cell phone. Sure enough, it was work; and I had to go in for a few hours to locate some fiber cards for a switch that needed to be installed this weekend. In fact, I discovered the message not immediately after I woke up; but as I was leaving the house, all dressed up to attend a formal function! It seemed like after that everything went askew. Everything else that I had planned to get done today either got put on hold; or delayed. What made up for it, though, was an e-mail that W3BBO had sent me. While I was grocery shopping this afternoon he sent me notice that Neal W3CUV, who I had mentioned in this blog a few days ago, was on the air on 7.050 MHZ from the Allegheny National Forest. I put the groceries away and ran down the basement, turned on the K2 and tuned to 7.050 MHz; and sure enough, there was W3CUV calling CQ amongst the din of the CQ WW WPX Contest. For the most part, Neal had a great signal into NJ; and his 2.5 Watts was a good 579 here when there wasn't any QSB. The band was like a rollercoaster, though; and Neal was bouncing around anywhere from 559 to 599. Finally, he dropped off the table and towards the end of our QSO he was about 339. During our QSO he told me that he was camped at a really beautiful spot and that he'd send some pictures via e-mail. I'll share them with you here when I get them. Neal is planning to return home Monday, if the weather is good tomorrow. So give a listen for him anywhere from 7.050 to 7.058 MHz from approximately 1800 to 2100 UTC (2:00 to 5:00 PM EDT). Tell him that W2LJ sent you! It was a beautiful day here in Central NJ, It was sunny; and we had beautiful blue skies. The temperature ran up to about 72 Degrees F (22 C), and it was a bit breezy; but very comfortable. But even better than that was that I got the chance to get out to the park near the work QTH during lunchtime. To maximize my operating time, I simply plopped the 20 Meter Hamstick on the magmount on top of the car. To my surprise and delight there were a lot of signals to be heard ... finally! There was a powerhouse station coming through on 14.040 MHz. CT/DL1YD was coming through 599 +++++. He was working stations DXpedition style; so I decided to give a call. On the second try, I snagged him! I got a 599 report, and I doubt that I was THAT loud; but there were no requests for repeats of my callsign - so my signal must have been at least halfway decent. 5 Watts to a Hamstick made it all the way over the vast Atlantic Ocean to Portugal. Just thinking about that boggles my mind. From NY to Portugal is about a 6 or 7 hour airplane ride. My 5 Watts covered that distance at the speed of light. Using less power than the average night light bulb; and I communicated with another Ham on the other side of the ocean. How can you become jaded by that; or come to regard such things as "routine"? After that, I called CQ up around the FISTS watering hole and had a nice conversation with Lloyd VE1VEI in Aylesford, Nova Scotia where it wasn't so nice - rainy and about 62 Degrees F. Signals were nice as we gave each other 599 reports. Unfortunately, I couldn't stay on with Lloyd for too long as I had to get back to work; but it was definitely nice to get two lunchtime QRP QSOs in the logbook. I've never been a real big 2 Meter guy, even since my earliest days as a Ham. I know a lot of Hams that exist for 2 Meter FM. For them, 2 Meters IS the end all and be all of Ham Radio. For me, HF is the end all and be all; and 2 Meters is well ...... 2 Meters. Just another facet of the hobby, nothing more - nothing less. On the ride home from work; I decided to flip on the 2 Meter radio in the car. I have it set for scanning the local repeaters; and it came to rest on the frequency of a quite popular repeater. And I began to listen to two Hams talking about the sunspot cycle, 6 meters and DXing. They were lamenting the lack of sunspots (like just about everyone else) and they got to reminiscing about the good old days. You know, the good ol' days - the days when you could get on 10 Meters and work the world with 10 Watts. The good ol' days, when you could get on 6 Meters and work all over the United States with just a few Watts. I was kind of blown away by the conversation, being intimately familiar with the realm of low power communications. I had the urge to pick up the mike and start extolling the virtues of HF QRP; but I didn't want to seem like a braggart. Gosh, we QRPers routinely work the world with 5 Watts or less - sunspots or no - every day. To us, 10 Watts on CW is akin to running 1.5 kW to a non-QRPer. 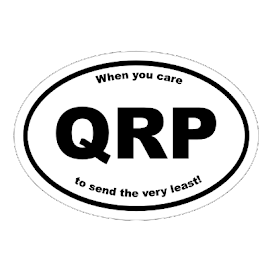 QRPers have to be careful sometimes, when talking about our special interest; because it can sound like we're denigrating the accomplishments of people who have never really tried QRP. There was absolutely no way that I wanted jump into that conversation, only to come off sounding like some kind of know-it-all snob. Which brings us to another point. There really are a lot of Hams out there who really have no idea of where 5 Watts of power can get you. I suppose we all started out like that, in one form or another at the beginning of our Ham careers. We all think that, "The more power, the better". But each QRPer seems to have a defining moment or epiphany where it dawns upon them that power isn't everything. Skill, patience and determination are equal values in the equation of Ham Radio success. I suppose brute force is nice sometimes; but it's definitely not everything. 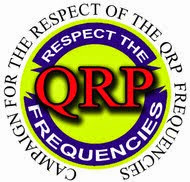 I dunno, maybe it just boils down to "You wouldn't understand, it's just a QRP thing!" I will be solo backpacking in the back country of the Hickory Creek Wilderness Area in the Allegheny National Forest, near Warren, Pennsylvania (northwestern Pennsylvania) this Memorial Day weekend, May 24, 25, 2008 .
new homebrew QRP antenna tuner, and using AA NiMH batteries for the first time. I'll be operating off and on throughout the day, but mostly between 2 and 5 PM EST. Frequency can be 7.030 to 7.060, but will try to stay around 7.050 and the FISTS calling freq. - 7.058. I'd appreciate it if you would put this info on your blog as a "Wilderness Alert". Hope to work you from the great outdoors. For many folks, the Memorial Day weekend is the unofficial start of Summer. Hopefully for those of us who live in the universe of Ham Radio, that will mean a lot of us will be taking to the field like Neal. Maybe not overnight; or for full blown hiking trips; but perhaps just out to the backyard patio table, or perhaps to the local park to sit under a shade tree, to get some air and some Ham Radio time in. If you've never tried it, I highly recommend it! There's just nothing quite like operating out in the sunshine and fresh air. It definitely beats sitting in a closed in shack (unless it's over 100 Degrees outside and that shack is air conditioned. Hi!) . The setup doesn't need to be elaborate. A small QRP radio, a key, a gel cell battery and a hunk of wire like a EFHW (end fed half wave) antenna or perhaps a NorCal doublet. Those are the ingredients for a fun filled, enjoyable afternoon - I promise! It's been an unusually cool and damp May, so far, here in Central NJ. In fact, when I woke up this morning, the outdoor thermometer was reading 42 degrees. Quite cool for May in New Jersey. Tonight promises to be just as cool; and as a result, my neighbor must have had his heat running because I had quite bad local QRN on 40 Meters tonight. Up until about 10:00 PM EDT, the QRN was about S9. So what's a Ham to do when the noise levels are unbearable? Heat up the ol' soldering iron - that's what! I managed to find homes for about a dozen more capacitors on the ATS-3 tonight. I'm actually seeing enough progress where in two more manual pages, it will be time for the initial testing phase. 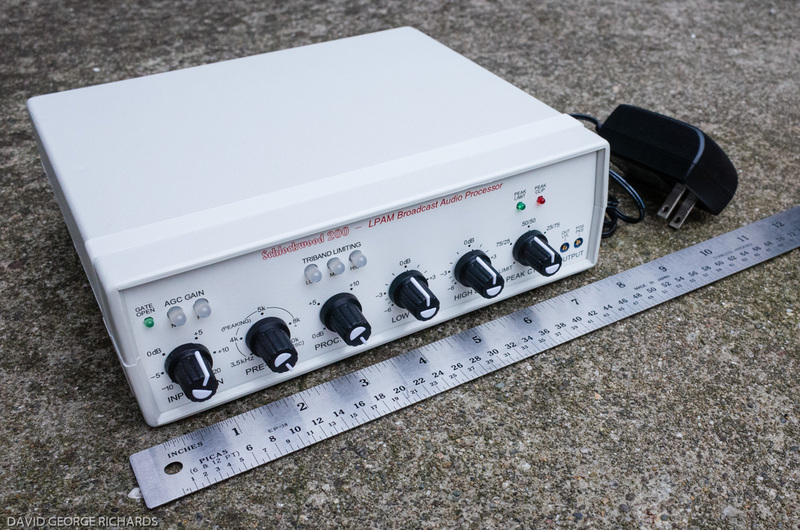 I swear, if I'm EVER going to make it into the QRP Hall of Fame; it will be for taking the longest amount of time to complete a QRP kit from start to finish. I almost launched a capacitor into never-never land by squeezing it just a bit too tightly with my tweezers. Luckily, it hit something on my construction table and rebounded right back to me. I don't need to go to the local electronics store and embarrassingly ask for one SMD capacitor! After I completed soldering, I turned the rig back on to find noise levels on 40 Meters back to normal. My neighbor's house must have reached the desired temperature. So I called CQ around 7.050 MHz using the bug for a change this time. I had a nice little QSO with John K9LIR. A friend of the family was in his shack listening to the dits and dahs. Seems she finds Morse Code fascinating. Tonight, I didn't sound too bad on the bug. I can tell you there are nights when the CW just flows out of my Vibroplex like musical notes out of a fine instrument. Other nights it's an abomination - enough to send women and small children screaming into the night. I guess the arthritis in my hand wasn't too bad and everything more or less "clicked". When I'm off and the CW coming out of the bug sounds particularly horrible is when I go back to the keyer and paddles for the evening. Believe me, I end up doing everyone a favor by doing that! Steve NØTU, who goes out to do a lot of portable QRP work accompanied by his two goats, Peanut and Rooster has set up a new blog - "Peanut and Rooster Adventures". It's VERY new and there aren't a lot of posts right now; but it is definitely one to keep your eye on. I've enjoyed watching Steve's videos on YouTube; and it's great that he's starting a blog about their adventures. For some reason, Google is very slow for me tonight; so I'll add Peanut and Rooster to my list of "Blogs of Interest" sometime tomorrow. Tonight was also the Flying Pigs monthly Run For The Bacon sprint. It was so good to see some activity on 20 Meters again! I actually made 5 QRP QSOs on 20 Meters after 9:00 PM Eastern time. Wow! It's either the return of summer time conditions or maybe Ol' Sol is getting a few freckles back? Hopefully this is a sign of good things to come. In any event, I broke the 1, 000 point barrier for the first time in a long time. It certainly helps that 40 Meters is QRN free for me now that the heating season is over. I was also fortunate to work Jim W1PID on 80 Meters during the Sprint. He was 599 plus plus PLUS and nearly blew my eardrums out! It was definitely a good thing that I had the ALC turned on, on the K2; or I might be saying, "Eh?" a lot right now! This coming week is the NAQCC monthly Sprint also. Keep an eye out on the announcements for that. I saw on the Flying Pigs e-mail reflector that Brain Murrey KB9BVN, a very good friend and brother Flying Pig is in the hospital undergoing some tests and possible open heart surgery. Brian can only be described as a "salt of the earth" kinda guy. He's a great Ham and his enthusiasm for the hobby in general and QRP in particular is infectious. He's also put in a good many years as a troop leader for the Boy Scouts, molding young minds with the ideals of good citizenship. So without getting all syrupy, I'd like to ask all of you who read this blog on a regular basis, if you would, before you go to sleep tonight, offer up a small prayer for Brian's continued health and safety. The image to the left is an aerial photo of the Dayton Hamvention circa the mid 1990s. The building in the middle is, of course, the Hara Arena. The cars appearing above the arena are in the parking lot. All the activity below and to the right of the building (which looks like lines of parked cars) is in fact, all flea market! That is what Hamvention was like when I last attended. I hear tales told "that it's not like it used to be". That's a shame, indeed! Some of the best memories I have as a Ham revolve around Field Day and Hamvention. I have been to Ohio for the "World's Largest Gathering of Hams" six or seven times, all told. I first went in 1985 and 1986. I remember the 1986 Hamvention because I had brought along some electronics text books; and in the evenings in the hotel room, I would study for the Digital Electronics Degree that I was taking at DeVry. Back in those days, I would go out to Dayton with my friends Barry WB2KLF and Mark N2EBA (SK). We stayed at a Knight's Inn in Dayton proper. I remember in particular the tacky purple drapes at the Knight's Inn. They were supposed to look "regal", I guess! Thinking back on them, the only word that comes to mind is "Ugh!". The best times at Hamvention were those during my tenure with the Piscataway Amateur Radio Club. My companions for those wonderful trips were Bob W3BBO who was living in Piscataway at the time, Rich AA2KS, Bill W2WK, Rich W2PQ, Charlie N2LHD (SK), Chuck WB2MSV (SK), Don KO2K, Jimmy N2LFI (SK), Marty KB2JSG and a bunch of others I can't recall right now. When the Piscataway group first contemplated going to our first Hamvention together, we met for dinner at Rick AA2KS's house in order to plan our trip. He lived in Edison at the time; and, boy, can his wife Pat cook! I've never, ever had as good an Italian meal as Pat could put together! If I remember correctly, our first trip out there together was in 1994. We caravaned with N2LHD leading the way, and four of us followed in Rich's brand new Cadillac. Rich W2PQ brought along a cassette tape of "The Jerky Boys" and we howled at the low brow humor on the trip out. In all, it was a twelve hour ride; and we'd start out on Thursday at about 5:00 in the morning to arrive in Fairborn at about 5:00 PM. Our first night's dinner always seemed to be at the "Spaghetti Factory" in Dayton. About 20 or so of us Hams from the greater Central NJ region had a sit down of good food (although not as good as AA2KS's XYL's) good talk and best of all, laughs. We stayed at the Homewood Suites in Fairborn where the AMSAT folks stayed. Bob W3BBO and I were big into satellite operating at the time; so that was an added treat. On our first trip in 1994 we got to the greater Dayton area; only to be greeted by tornado warnings! Back then, Hamvention was in April and the weather could be wild and woolly. You had to be ready for anything from snow to heat to rain to hail and thunderstorms! I think that Mark Twain must have been to Dayton once or twice. He must have, because he was the one who came up with the line, "If you dont' like the weather then wait five minutes!" That was Dayton in April to a "T"! If it was rainy, there was mud everywhere! Rich AA2KS would make up wipe our shoes off with a towel before we dared get into his brand new Caddy! And when it rained, it poured! I remember, in particular, being caught in the midst of the flea market during a downpour and was lucky to have brought along an umbrella. Not so lucky was some guy who was selling boat anchors (antique radios) that were sitting on the ground, only to have a mini torrent of a storm created river run through them! Hopefully the prices on those fellas got knocked down! To me, the flea market WAS Hamvention. I spent more time outside than inside. I always looked for "oddball" items. I remember one year I bought two little pieces of nylon that were embroidered with the words "REMOVE BEFORE LAUNCH". It turned out that these tags were safety pins from fighter jet ejection seats. They would be put in place so an ejection seat couldn't accidentally be launched while the aircraft was parked. Where else could you buy something like that except for Hamvention? I never made the "major purchase" of a big ticket radio at Hamvention; but if I had wanted to, there was plenty of opportunity! All the biggest vendors were inside the arena; and you could do a lot of price comparing before you decided to plunk down the big bucks. Guys literally spent hours going from booth to booth doing careful shopping. I first became a member of FISTS at the 1994 Hamvention; and I remember meeting Tom Dandrea N3EQF, the author of Log-EQF at that Hamvention. I had already been using Log-EQF since 1992; and it was nice to actually meet and talk with him there. I bought a Kent Twin Paddle at Hamvention one year as a kit. That was a great paddle and like an idiot, I sold it a few years back. The second year that we went out there, I brought a laptop along that I borrowed from work. I was a member of AOL at the time; and during the evenings I would go online and would host a "chat" for the Amateur Radio Interest Group. I would fill them in on the latest and greatest and would answer any questions that they might have had. Luckily, the Homewood Suites was pretty sophisticated at the time. The phones in the rooms had extra jacks on the side, which made plugging in a modem a rather easy thing to do. That was fun and rewarding experience. I've never had the opportunity since then to play "on the scene Reporter"! The Hara arena was the place to be for the Forums. I only went to a few during my times at Hamvention; and the best was the "Electrical Safety" forum put on by Ohio Central Power and Light. They used great visual aids to impress upon us the dangers of getting near power lines. You all know those familiar words, "Never put your antenna near live power lines". There's ample good reasoning behind that as O C P & L showed us. They demonstrated what could happen to your hand if it came in contact with a power line by turning off a circuit breaker box and taking out a huge buss fuse and replacing it with a hot dog. Literally moments after turning the power back on, the hot dog exploded! They also demonstrated how items that we thought were non-conductive, are not so in real life. Let's say for instance, one leg of your dipole falls across a power line. You get the genius idea to use a corn broom to whisk the wire away, right? After all, the broomstick is wood and the actual broom is just straw, right? Won't conduct electricity, right? WRONG! At power line voltages, there is enough water in that wood and straw so that if you actually tried to do that, it would be the last thing you did on earth Try to explain to St. Peter why you arrived at the Pearly Gates with all your hair and eyebrows singed off! At the end of your first day , you were always the victim of sensory overload! Look how disheveled (but happy) I was at the end of Day One during one of my trips out there! By the way, you probably can't notice it from the size of the photo; but the callsign cap I was wearing had N2ELW on it. I had that callsign from 1983 until 2000. I was also wearing my official Piscataway Amateur Radio Club baseball jacket, which I still have! Those were the days! I was about 20 pounds lighter, had way less gray hair and way more energy (and disposable income) back then. Days Two was always good as the routine was to make sure you soaked in everything you might have missed on Day One. But Day Three (Sunday) was always mixed with sadness and gladness. You were happy to be getting back home to your loved ones; but sad to be leaving the "Ham Radio Experience of a Lifetime" and if you were like me, you were undoubtedly disappointed that you didn't win any of the fabulous Hamvention Door Prizes. I hope all of you out there have either gotten to or will get to experience Hamvention at least one time in your lives. I guarantee (1000%) that you will remember it forever! My goal remains to make it out there at least one more time so I can finally attend a "Four Days in May" QRP convention. It's been an EXTREMELY busy week at work. We're opening a new Data Center and I've been deluged with preparing all the Cisco networking equipment that will go in place ahead of the servers. By the time I've gotten home each night; and have done the normal "Daddy" things that I do when I get home; there's been nothing left over in the tank for radio. It's been a week of getting up early, going to work early, getting home late and getting to bed early! And to think that when I was a kid, I couldn't wait to grow up! Sometimes it's not all it was cracked up to be. Hopefully this weekend, I will scrape together some time to get on the radio. I have an idea or two in mind for "Website of the Week" for next week. I also need to find some time to just veg for awhile and recharge the ol' batteries! And through all of this, I've been wishing VERY hard that I would wake up, find out that this has all been a bad dream; and that I was really at Dayton and FDIM !!!!! This week's Website of the Week is an off-shoot of the ElectronicsUSA Website. For those not in the know, ElectronicsUSA.com is where you can go to purchase Whiterook keys and paddles. By making the recommendation that I am about to make, I am in no way endorsing anyone's product. That being said, if you go here, you will enter a great gallery of photos of Tuna Tin II kits that have been built by various Hams. Talk about variations on a theme. It's almost like snowflake phenomena - no two Tuna Tin IIs are quite the same. Enjoy the photos - I hope you get inspired to pick up your soldering iron and build something! 'Twas a busy week the past week! My son made his First Holy Communion on May 3rd and Mother's Day was just yesterday. Getting ready for both weekends left precious little time for radio or blog posts for that matter! But I did get on the air for just a tiny bit yesterday; and for a greater bit tonight; so I haven't been totally radio starved. And last Thursday night, 40 Meters was especially nice! I managed to work Ireland, Hungary and the Cayman Islands all within the space of about 20 minutes! It was a night of good conditions. However, what I really wanted to note is that I've been making steady progress with the ATS-3 and I should have it done soon; unless something comes up out of left field! I noticed tonight that I have more than half of the SMT devices mounted. If things go well, I should be able to take the finished radio on vacation up to Lake George this summer. Speaking of "summer"; the weather here in New Jersey so far this May has been cooler and wetter than normal. Friday we had over 1.25 inches of rain. The weekend was breezy, raw and uncomfortably cool. Ideal weather for the grass; and it's been growing faster than I've been able to keep up, mowing-wise. Tomorrow is supposed to be a day to buck the trend. We're looking for sunny skies and highs around 70 degrees. Hopefully, I'll be able to get to the park during lunch and will be able to break out the K1. I'm thinking of stowing the mag mount and Hamsticks in the trunk to see if I have better luck with those over the PAC-12. Maybe I'll make my first portable QSO for 2008 if I get lucky. Every now and then, you win one! I should begin this post with a preface like the one from "Dragnet". "The story you are about to read is true, the names have been changed to protect the innocent." 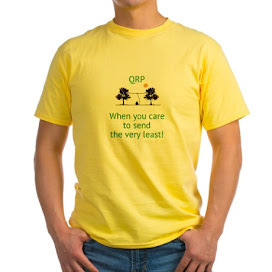 A few years ago, I got into a pretty nasty and heated argument (via e-mail exchanges) with a Ham about QRP. In general, this guy gave me the old "party line". "The receiving station does all the heavy lifting ......."
"I've never heard a QRP signal that wasn't difficult to copy........."
"Yadda .... yadda .... yadda"
Shortly after our disagreement (maybe a few months later) I happened to come across him on the air. We ragchewed for a bit and lo and behold, he gave me a 599 RST! We're several states apart; and at the very end of the QSO, I let it out that I was QRP and was running 4 Watts (at the time). Needless to say, he was stunned. He didn't think that a QRP signal could EVER be loud, despite all my explanations of propagation and all that good technical sort of stuff. The coup d' grace came tonight. Another e-mail explained how his QRO rig finally gave up the ghost after umpteen years; and what is my opinion on either the Yaesu FT-817 or the Icom IC-703? I'm happy that I was able to able to bring excitement and fun back into the life of a Ham who admitted he was beginning to feel rather blase about the hobby. He confided to me that QRP has given him back the excitement and thrills that he experienced back in his days as a Novice. Now THAT's cool! BTW, we've come to be pretty good friends and we exchange e-mails on a regular basis. Joe has a folksy way of telling stories that are fun to read and easy on the eyes. He also has an article about an antenna that I used for about 18 years with great success! I personally vouch for "The $4 Special" !!!! Anyway, pop on over using the hyperlink I have provided, I think you'll enjoy visiting for a spell. So some might say this doesn't count since there was an Internet in between, but still. Radios at both ends, and I think you'll agree it's exciting. I e-mailed Mr. Brady KE7OMC and told him it was his for the asking. If I can help in some small way for a young Ham to become even more interested in CW and QRP; then it will have been well worth it! Anybody have a 40 Meter receiver kit that they'd be willing to give a deserving home? I got another bunch of capacitors soldered on to the ATS-3 circuit board. Wow! My eyes are definitely NOT what they used to be! In a few days I'll turn 51 and even with bifocals, soldering this teeny tiny stuff is an adventure. Used to be that I could read the small print on tiny capacitors with no trouble. Now I need all kinds of help - bifocals, an Opti-Visor ..... whew! Sight problems notwithstanding, it was another pleasant night on the air. 40 Meters was in excellent shape and I started off the evening with a short ragchew. From there I went to the lower portion of the band to see what DX I could sniff out and I worked HI5 (the Dominican Republic) and S52 (Slovenia). I also heard a YV5 station (Argentina) that was coming in loud and strong. Argentina would have been a new one for me via QRP; but this op was really interested in rag chewing. There's nothing wrong with that, of course, and I would have hung around if I wasn't so darn tired! A "real" conversation with a DX station is always a good deal; and doesn't happen often enough. But tonight, all I have in mind right now is my head hitting the pillow; which I am going to do as soon as I finish this post!